← Where are the Starry Campions? The following article was reviewed by Dr. Claire Rutledge, in charge of Emerald Ash Borer Research at the Connecticut Agricultural Experiment Station (CAES) on 4-21-2017. Written by Sigrun Gadwa, it was edited by members of the CBS Conservation and Ecology Committee and the Cheshire Land Trust. Will ash trees soon be just a fond memory? The larvae of the iridescent Emerald Ash Borer(EAB) have killed over thirty million ash trees in the North America since it arrived from Asia in the early 1990’s in the Detroit, MI area. Ash is an important tree of wetland and upland forests, farmland hedgerows, and urban neighborhoods. Currently ash comprises 3 to 5% of our forests, but in some parts of the state it reaches 20% of the trees. Ash is an attractive, spreading shade tree, and its wood is also very useful! Ash firewood is excellent; it seasons quickly, burns hot but slowly, and is easy to split. The wood is also valuable as lumber and for woodworking, for example, durable, blond kitchen cabinets and the best and safest baseball bats. The EAB beetles feed on the inner bark (the phloem tissue). By gouging serpentine galleries, the borers disrupt the trees’ internal nutrient and water transport system. Trees die within 3-5 years. Once die-back in the canopy reaches 50 percent, the tree’s demise is certain, and there is no point in applying systemic insecticides, an option for control if done soon enough. 1) Avoid transporting ash firewood or lumber, if bark is still on. 2) It is also important to take down stricken trees, and properly treat the infested bark and branches. 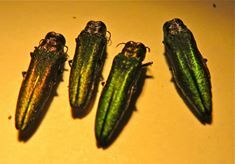 Beginning in mid-May, and through the early summer, the EAB beetles will transform from dormant pupae into emerald green, flying beetles, emerging from ash trees via tell-tale “D”-shaped exit holes. Taking down infested trees will prevent many EAB’s from flying off to other healthy ash trees, to lay the eggs for a new generation. Biological control, fortunately, offers a reasonable expectation for success over the long term, against the Emerald Ash borer (Agrilus planipennis), a native to Asia. 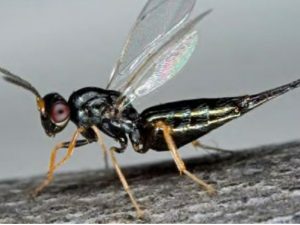 In 2013, under the direction of Dr. Claire Rutledge, the CT Agricultural Experiment Station (CAES), two tiny, Asian wasps (Oobius agrili and Tetrastichus planipennisi) were released in Connecticut and have been monitored for four years; Spathius agrili was released last year. These wasp species lay eggs on EAB eggs (Oobius) and larvae (Tetrastichus and Spathius), regardless of whether the ash species are American or Asian. The new crop of bio-control beetles emerges slightly before the EAB’s. Oobius is very hard to detect, but the spread of Tetrastichus (shown below) was documented, about 2.5 miles in two years, and it tolerates our climate. All the tiny wasps meet a key criterion for any bio-control agent: host-specificity – they do not parasitize native bark insects. However, widespread establishment of these bio-control wasps is expected to take at least 10 more years. Development of EAB-resistant strains of ash is also a slow process, but has a high expectation for success. The Asian species of ash are all resistant to EAB, and forestry researchers throughout the Northeastern US are working on breeding/locating resistant strains. David Yih, CBS President, asks anyone who finds a surviving ash tree in a hard-hit area, to report it to CAES.StateEntomologist@ct.gov or 203-974-8474. American ash species already have the potential to produce defensive phenolic compounds, that inhibit growth of EAB larvae. However, currently, most ash trees do not detect the burrowing EAB beetles, and therefore do not deploy their defenses – the missing link to EAB resistance. Both Claire Rutledge and Douglas Emerthal of CTDEEP urge Connecticut citizens, institutions, and towns to take action to SLAM or “Slow down Ash Mortality” to give the bio-control wasps more time to establish themselves, and for development of EAB-resistant ash strains. These agencies are educating citizens on proper disposal of the bark and wood, in order to kill the dormant pupae. Chippers must grind the wood small enough to ensure EAB mortality: no more than one-inch across, in at least two dimensions. Before removing a tree, learn to identify it as an ash; if unsure, consult your local arborist or another expert. All ash (Fraxinus) species have opposite branching, compound leaves, and tightly ridged bark. Hickories, black oaks, and young cottonwoods have similar bark but alternate branching. Identification resources include https://gobotany.newenglandwild.org and and http://www.ct.gov/deep/lib/deep/forestry/eab/emerald _ash_borer_quick_reference_guide_final.pdf . High woodpecker activity is a tell-tale sign of EAB infestation, and is somewhat helpful for slowing EAB spread. Look for long vertical streaks of exposed, sheared off, light tan bark, as shown below. Woodpeckers and nuthatches can consume up to 85 percent of the EAB beetles in one tree, per a University of Chicago study – and their populations are growing in regions hit heavily by EAB. Helpful, but not enough. If handled properly, use of EAB-infested ash trees for firewood, lumber, or woodworking can be a thrifty alternative to huge piles of ash wood chip mulch. Wood of infested trees is still valuable for firewood or as lumber, after debarking, since beetle galleries are in the inner bark. The town of North Haven recouped $1500 recently, by selling ash lumber from infected street trees. EAB beetles (and other wood insects) can be killed either by debarking and chipping the bark, or by baking wood sections in a kiln. Wood with bark should only be transported and processed during the dormant season, October through March, although transport in any season is risky. Chunks of wood, bark, and debris on the truck bed, can shed EAB pre-pupae. Or EAB beetles can emerge while the wood is waiting for kiln treatment in a pile at a facility. Unfortunately, most tree removal companies do not debark on site, and very few Connecticut kilns are government-certified. The USDA requires a very high internal wood temperature of at least 60 degrees C (140 degrees F) for at least an hour. One option for an industrious property-owner is to purchase a chain-saw mounted debarker on line and debark the logs of dying ash trees on site, using a tarp and chipping up the bark debris and branches. Clean wood can safely be stored on site under cover, or sold, helping offset tree-felling costs. Even if you are unable to debark the tree, taking it down, chipping the smaller branches, and storing the rest under a tarp will significantly reduce the population of beetles emerging from the tree. Our towns, and the state as a whole, need a non-wasteful, practical system for handling – and recycling – infested wood with negligible EAB dispersal, as well as more readily available debarking services and many more certified kilns. On-line guidance is available for recycling paper, plastic, etc., but not for diseased trees. Treatment with systemic insecticides is an alternative to control EAB, primarily for lightly infested, valuable tree specimens in an residential or urban area, though it’s also expensive and has significant downsides. To avoid killing pollinators that feed on the copious pollen produced by ash trees in early spring, the CAES guidance fact sheet recommends applying the product dinotefuran, after the ash bloom period, when the ash samaras (winged seeds) are starting to form, as pictured below. Dinotofuran has a short-residual, in contrast to other more persistent, systemic insecticides like imidacloprid, clothianidin, and emamectin benzoate, which pose a long-term risk to many harmless insects, such as the inch worms that nesting birds feed to their young. CAES is currently researching whether systemic insecticides may harm bio-control wasps. Broad-spectrum contact sprays are also a real environmental hazard, and may interfere with the spread of the bio-control wasps; drift is often substantial, especially for a tall tree. Note that heavily infested trees cannot be saved by insecticides. However, it seems wise to preserve some ash trees with systemic, non-persistent insecticides in a very hard-hit area. Their seeds will be able to recolonize the area, once the wasp bio-controls are well established. 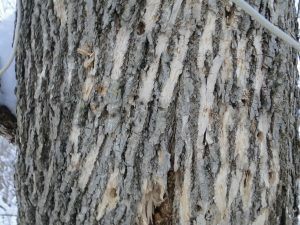 In summary, CBS urges Connecticut residents to take down infested trees, using proper treatment of the inner bark, and to be alert for surviving ash saplings and trees. In part so that trees with resistance to EAB may be detected, but also for the sake of the 100+ species of arthropods that have no other host plants – and the birds that feed on them – we do not favor widespread, proactive removal of healthy trees or widespread use of insecticides. And finally, continued research, resistance breeding, and outreach by tax-funded agricultural extension and environmental agencies like CAES and CTDEEP are essential if ashes are to persist in the Connecticut landscape. In the current political climate these organizations are being targeted for drastic budget cuts, so please let your state representatives and officials know how important this work is. Photos by Peter Rzasa (EAB beetles), David Cappaert (Tetrastichus wasp) & Sigrun Gadwa (ash bark) or public domain.